As the digital age creates the possibility of separating the meaning of a text from its mode of presentation, textual scholars and digital humanists need to be able to think clearly and creatively about what a text really is and what it means to encounter that text in different contexts and in different media. This seminar will initiate a discussion focused around these questions with both classical readings and practical examples. The seminar will begin with a discussion of Marshal McLuhan's famous pronouncement, the "Medium is the Message", and reflections on the power of media to shape consciousness. 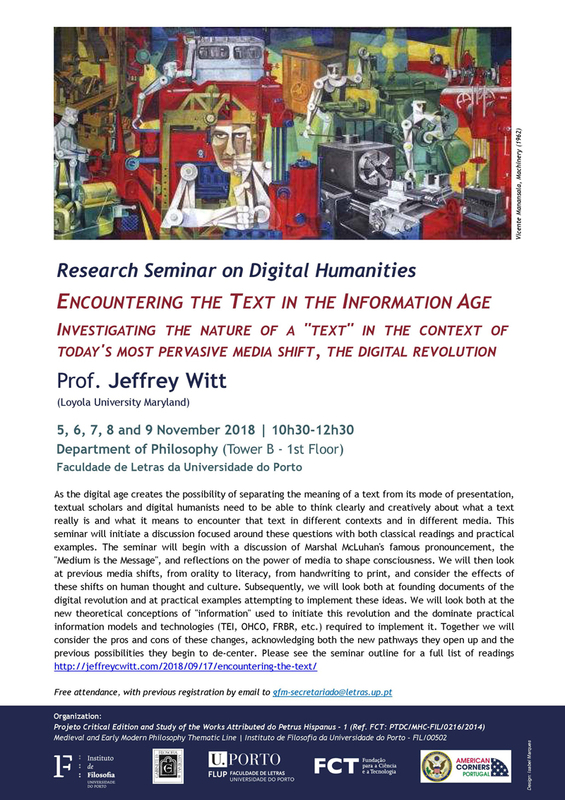 We will then look at previous media shifts, from orality to literacy, from handwriting to print, and consider the effects of these shifts on human thought and culture. Subsequently, we will look both at founding documents of the digital revolution and at practical examples attempting to implement these ideas. We will look both at the new theoretical conceptions of "information" used to initiate this revolution and the dominate practical information models and technologies (TEI, OHCO, FRBR, etc.) required to implement it. Together we will consider the pros and cons of these changes, acknowledging both the new pathways they open up and the previous possibilities they begin to de-center. Jeffrey Witt is Medieval Philosophy Assistant Professor at Loyola University Maryland, and acts as international adviser of the project Petrus Hispanus. With growing interests in digital humanities and the process of moving philosophical texts from their original manuscript form to media more accessible to the community of scholars, is currently developing a web publishing framework for medieval Sentences commentaries and other texts.